By 1966 the new Birmingham was triumphant and even a reporter in ‘The Times’ was moved to exclaim that it was one of the showpieces of Europe. 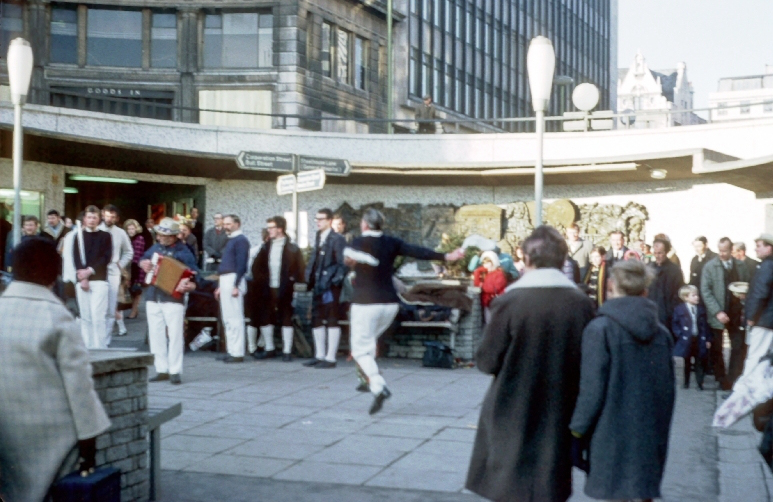 The old Bull Ring had been swept away from the landscape so swiftly and thoroughly that now it was merely a memory. In its place had been constructed a futuristic Bull Ring Centre that boasted 350,000 square feet of retail trading space and which drew superlatives from its supporters. They proclaimed it to be the ‘world’s most advanced shopping centre’, and declared that its market hall was not only the finest retail market area in Europe but also perhaps across the globe. Overlooking this tribute to modernism was the iconic Rotunda. Cylindrical in shape, it was 266 feet tall and was one amongst many high-rise buildings that were transforming Birmingham’s skyline. Below it, cars were driven along the Smallbrook Queensway, the first section of an American-style freeway that would soon encircle the city centre. 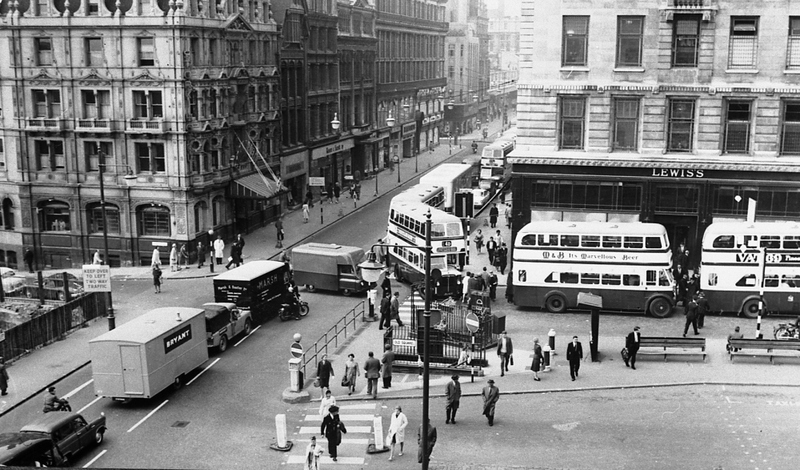 Opened in 1960 its pedestrian subways heralded the new age in which citizens who walked were to be forced below the ground in motor city UK. Once a city of red brick, blue brick, terracotta and sheet glass, Birmingham was fast becoming a place overwhelmed by exposed aggregate concrete, synthetic laminates, glass tiles, plastic rock walls and prefabricated building processes.Pallid of tone and hue, Birmingham was given colour here and there by the wonderful murals of master mosaicist Kenneth Budd. By late 1966, he had completed two projects: the Civil War Mural and the Horse Fair Mural. This latter had gained national attention. Featured as it was in ‘The Times’ when it was under assembly and then after its unveiling, it had also drawn much favourable comment locally; but not everyone in the City was as appreciative. In December of that year a group of staff and lecturers from the Birmingham College of Art complained that Birmingham’s murals had been virtually designed and executed by one operator – Kenneth Budd. At a public meeting, to which ‘The Guardian’ sent a reporter, the head of faculty of fine art damned them as ‘neo-Fascist art’ that was reminiscent of what had happened under Mussolini in Italy. It is difficult today to find any sympathy with such a viewpoint, especially when another critic came to a completely different conclusion. He pronounced that Budd’s proposed Kennedy Memorial was ‘sentimental and sugary sweet – mere illustration of the worst kind’. Others amongst ‘the inflamed action group’ were at pains to make it clear that Kenneth Budd was ‘a fine chap’ and his work was ‘technically proficient and punctual’. Indeed it was argued that it was these qualities that ensured that the Council’s Public Works Committee ‘leaned on him too exclusively for work that avoided public outcry because the aesthetic element was undistinguished’. The meeting was told that it was time that a register of local artists was drawn up, along. There should also be a panel of experts to advise the Public Works Committee ‘on who should decorate the redeveloped city’. A concrete outcome was that college men were to discuss policy and then invite the chairman of the Committee to meet them. Be that as it may, the Committee continued to show its faith in the skills and artistry of Kenneth Budd and whilst he was preparing for the Kennedy Memorial he received another commission. In his notebooks, he recalled that ‘the Inner Ring Road continued cutting its way remorselessly through the City centre, and another section, the Priory Ringway shopping Precinct was nearing completion’. This was close to the Old Square ‘in whose fine Georgian Terraces many notable Birmingham characters had lived’. In the new development a concrete end wall ‘positively invited some form of mural decoration’. Accordingly Kenneth submitted designs depicting the history of the area from the time of the Priory of St Thomas onwards to Neville Borg, the City Engineer. Herein lay was another reason for the Budd’s success – he acted and did not wait to be approached or for meetings. Borg gave the scheme his blessing providing that costs did not exceed £1,000. Having worked on mosaics at the Horse Fair for the previous seven months and with the prospect of more mosaics to come with the Kennedy Memorial, Kenneth decided that the Old Square Mural should be designed as a bas-relief, to be made from cold-cast brass and lead. Once again his background research was helped by Dorothy McCulla, the renowned local studies librarian at Birmingham Central Library. Eventually the design was ready to be taken up the M1 motorway from the Penge Studio to Birmingham. For presentation purposes it was presented as a cold cast metal maquette and was only removed from the mould at the last minute. Consequently, Kenneth spent most of the previous night ‘in the hotel polishing away with Brasso, to have the maquette bright and shining for the Committee meeting the next day. Now everyone could set to and ‘we began laminating over the metal with glass-fibre. Once each part was thoroughly “cured” it was released from the mould and polished’. Finally a coat of acrylic lacquer was applied to retain the burnished finish. The fixing of the relief onsite was accomplished in just a morning ‘and the surrounding wall, including the fixing flange of the bas-relief, was then covered with cladding mosaic’. 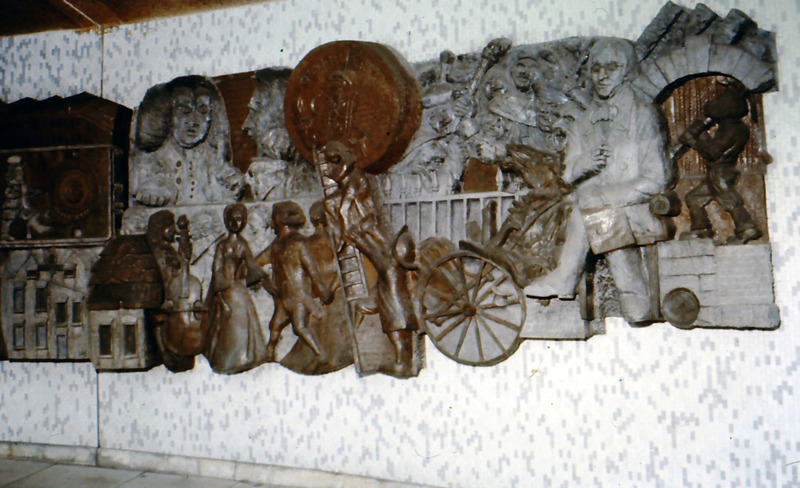 The Old Square Mural was unveiled on April 21, 1967 by Alderman C.V. Simpson, chairman of the Public Works Department. Thankfully it has survived, despite another major redevelopment of the Old Square locality in the early years of this century. Unhappily only sections of Kenneth’s next and final Birmingham mural remain. This was the Great Western Railway, a mural which he regarded as his magnum opus.